Even before you appear to cross the final loop and successfully complete your course, it may be any technical or management oriented, the first & foremost thing haunts your mind is securing a proper and beneficial apprenticeship. An apprenticeship is the most crucial part of a study which actually adds fuel to the career which helps it to run for ages without many breaks. Here are few points jotted which could help you in finding a appropriate apprenticeship after your course. 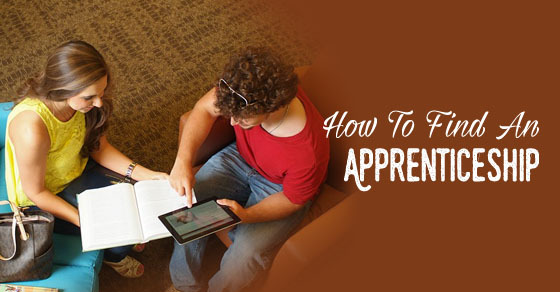 The following mentioned are few tips that help you gain apprenticeship opportunities. While your study is on full swing, it’s the most primary job to look for the trait in which you are interested the most. In this decision you may anyways take the help of your teacher, the course counsellor, peers, family or any career counsellor to help you find your best suited trait. A mistake or wrong selection of a trait will be enough to ruin your entire career. While you are in the decision making phase for your proper trait, it would be a wise step to search the web. The internet these days have become very rich helpful in finding out solutions to questions with number of discussion panels, blogs, quiz pattern solutions. Over the net you may also have chat with counsellors from other better universities as well. A number of career specific forums also prove helpful in deciding on your career & apprenticeship. You can also be able to find the skill sets required to pursue a career in your field of interest so that you may develop and polish yourself according to the requirements. A proper cover letter describing you and your passion to work as an apprentice along with a resume highlighting your skill sets, will add fuel in your search for an apprenticeship programme. A career counsellor can be of great help to you here. A counsellor will guide you and may also work for you in framing your resume suited to the company needs highlighting your required skill sets. Such a high quality cover letter and resume would help a lot in attracting the employer. In today’s world nothing is impossible. To make the securing of an apprenticeship easier, nowadays a number of pre-apprenticeship training programs are available. Such training would help you secure skills that you would require in your day to day happenings as an apprentice. By participating in such pre-apprenticeship course you would be able to get a taste for the trade. There are several websites that would help you search for such Pre-apprenticeship course and direct you about their entry requirements as well. While you are in the process of polishing your skills and making yourself able of an apprenticeship, another point could be very helpful i.e. talking to a local business owner on the qualities they look for in a new apprentice. Finding out the suited qualities for yourself and brushing them up could help you a lot in getting through an apprenticeship interview. The next and the most vital part are to look for an appropriate employer who would take you as an apprentice. There are several ways to search your probable apprenticeship. First you may expect a call from your course counsellor who could arrange for an apprenticeship for you from their circle of acquaintances. But many are not as lucky to have one from the college itself, they have to arrange for their own apprenticeships. It may sound a bit weird but it’s beneficial at times. Start calling your local businessmen and place your interest for an apprenticeship. It might happen that you meet a man who is actually looking for apprentices on the other side of the phone. Finding an apprenticeship is a hard job in many cases, so keeping no stone unturned will be beneficial. Another way to find an employer is to approach the trade’s union hall. This is a place where you could get to meet with people who are engaged into various businesses, probably there you may find the one who could be interested in your skills and would like to hire you as an apprentice. Job fairs are those places where number of companies and their representatives attend with their vacancies and job opportunities. If you are looking seriously for your apprenticeship, then a visit to such job fairs may turn beneficial for you. There you would be able to find not only one, two or three companies but many at a time under a single roof. There chances of getting through your apprenticeship offer would be higher. You might not be offered on the spot but your good network may bring you contacts for one in future, which is even beneficial over the time. When you are seriously looking for an apprenticeship and at the same time fresh pass out from your course, you would be knowledgeable enough about the trend companies, who could be your probable recruiters. Most of the companies nowadays prefer advertising in online media than print media. Going through the company websites can also prove beneficial as they have their vacancy as well as business apprenticeship schemes, opportunities listed in their official websites as well. With almost all newspapers, there comes a supplement based on different sections. There are job supplements too in which companies put up their job vacancies as well as apprenticeship advertisements. Scanning these newspaper ads may help you in finding your apprenticeship opening. There are several newspapers fully dedicated to job openings, they may also prove beneficial in your search. Networking is a very vital point in professional world, it’s required in every aspects if you really want to work well. Talk to everybody in your connections and let people know that you are looking for apprenticeship. Talk to your friends, family and their acquaintances in the business world. You never know which option may click. You may also get offers from places where your relatives or friends work. Most of the companies have their contact details updated in their professional website. If no job or apprenticeship vacancy updated is available, do not hesitate to give a cold call thus trying to find out if there are any such opportunities. Another very important way to get in contact with prospective recruiters is the professional site like LinkedIn. Here you could sign up with a profile where you will have your skill sets described along with your achievements and start contacting prospective employers who may have unadvertised apprenticeship openings. To get employed as an apprentice or trainee there are basically two ways, one is directly by the business owner. Here the business will meet all your needs pertaining to training and apprenticeship. Whereas on the other side there are Group training organizations who act as middle men. They work from looking for employers for you to paying of your wages. They will also place you with different businesses for your best achievement of on-job skills. Another very rich source of employers information and their opportunities the registers for approved employers. Here those employers who are eligible to hire people for job & on-job training enlist themselves so that those eligible candidates who are looking for opportunities find it easier to get in touch with their prospective employers. Just after gaining a minimum qualification it is very beneficial to enlist your name in the Employment exchange books. As you keep on adding up qualifications you keep on updating. Just like you are looking for employers to offer you apprenticeship, there are employers also who does look for apprenticeships. In such conditions they prefer consulting and searching for the candidates in the Employment exchanges, where they have updated data of all eligible candidates. Getting through the process of acquiring an apprenticeship is a hard nut to crack. As a successful completion of an apprenticeship gives you a big mileage in long run of your career, finding the right apprenticeship i.e apprenticeship search is that much hard too. When almost all ways seem to achieve no result you should never hesitate to directly walk into your listed companies and place your request along with your resume. Worst may be you would not get a call, but you may always expect a call in future as they always keep such forced applications stored in their company data base. This is your testing time and becoming choosy with apprenticeship may come as a boomerang to your bright career. So, even you are getting an opportunity to get trained in your dream company or a grade ‘A’ company as a labourer. This is a positive sign and it would pin point the fact in your employer’s mind that you are a learner more than a mere earner. This would also help you to come across many people thus helping you build your network in the industry, which could be in turn beneficial for your use in near future. Once you are finished with the search for your probable employer, its turn to work on a few more factors. The next most important step is to look for and set an Apprenticeship Network Provider or a training organization who would help set things between you and your employer. The training organization is crucial because it helps in settling down training terms & conditions. The training organization will set up a training plan which would outline the things that would be learnt and delivered in due course of time. It would be the due responsibility of the training organization to provide you with a proper training document which would act as a record or your training. As it would be their responsibility to check the delivery, it also will be their part to cross check and assess your receivables. The training organization will duly issue qualification certificate on your successful completion of the training. A proper training contract is to be formulated to provide a firm confirmation on the apprenticeship. You should be aware of the costs pertaining to the training. You need to be very well assured whether the apprenticeship would be a paid one or you have to pay for the training cost. As you get to start your apprenticeship or on-job training, be sure to get informed about the probationary period for the same. A probationary period is to be set after which the either party are eligible to decide on the continuity of the training. Decision on the training, whether it would be an on–job or an off- job is vital to be decided on. In an off-job training the employer would visit your classroom. Getting a worth apprenticeship can make one’s career, since it provides the opportunity to know and do hands on work while learning all those one have acquired from the books. In an apprenticeship program you are not treated as a student but you will be always treated as a worker to the organization. Good companies look in for a good apprenticeship record in your resume just because of the fact that you are trained on hand possessing a lot of real life work experience with updated skills and knowledge. Your work doesn’t end here with the getting of a suitable apprenticeship, but here the main core responsibility begins to successfully complete since a positive or a negative feedback can make or mark your career.